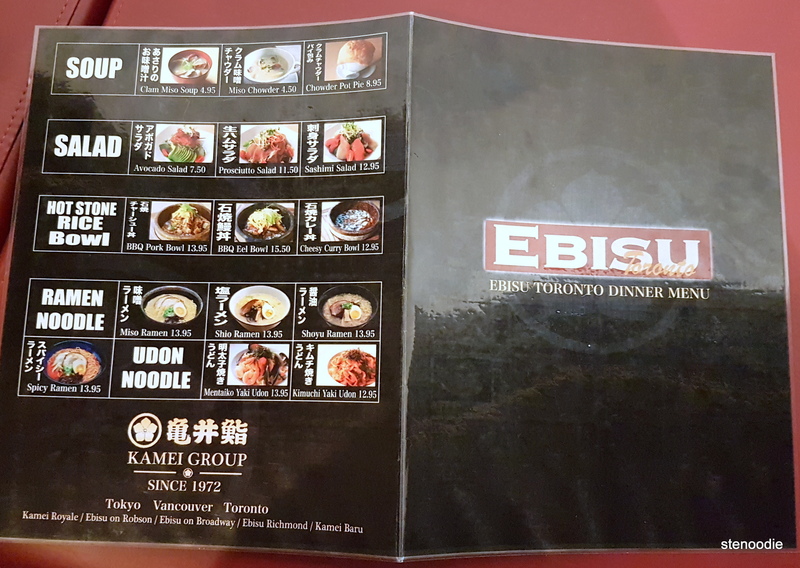 Ebisu is a sub-brand of Kamei Group in west coast Vancouver, BC. 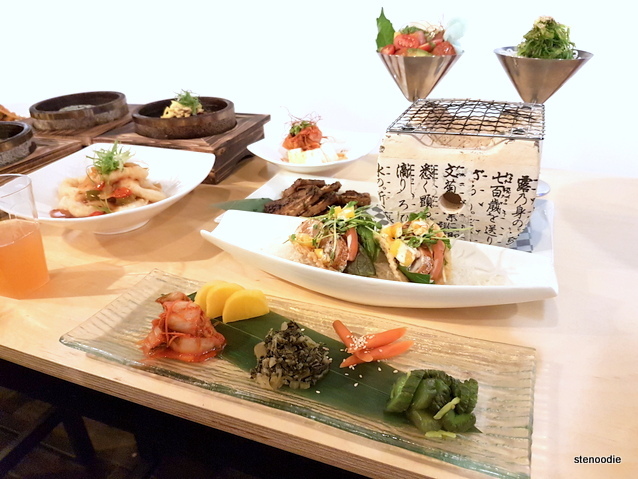 They serve a variety of Japanese izakaya items including sushi, ramen, curry, and donburi. Their first extended branch is now newly opened and this grand opening party commemorated that. 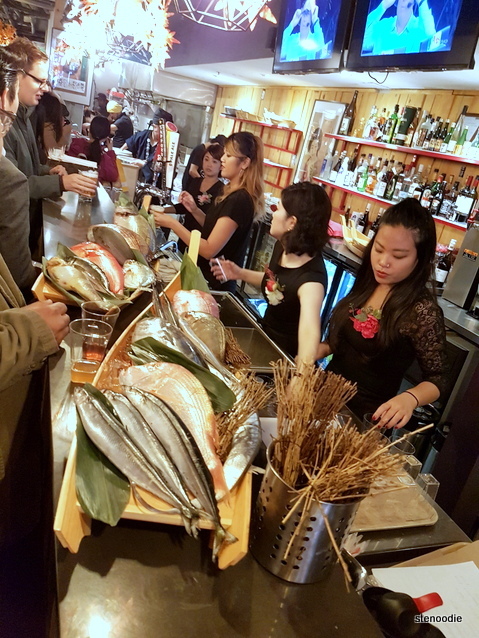 The location of Ebisu featured a long narrow hallway, which at the time of the party, was used for mostly mingling purposes. 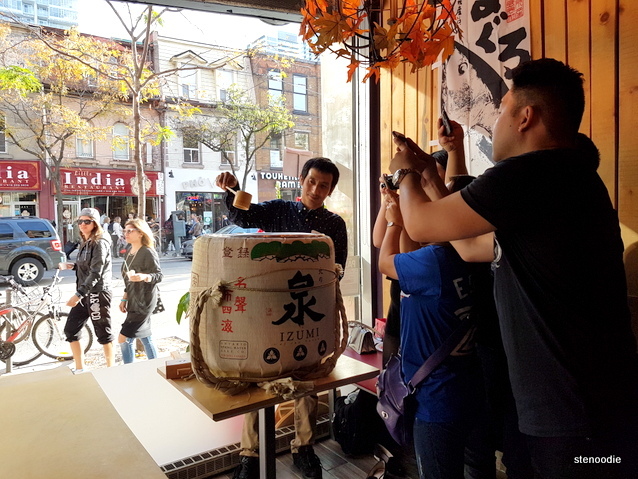 At the back of the restaurant, there were two tables filled with samples of their full dishes all positioned neatly for food enthusiasts and party attenders to photograph the food items to their hearts’ content as well as a small area of booth seats and high tables. Seeing as this was called a “party”, I did understand that it was expected to be rowdy and a bit crowded, but perhaps Loopp Media Inc. could have bit a bit mindful of their expected number of attendees. 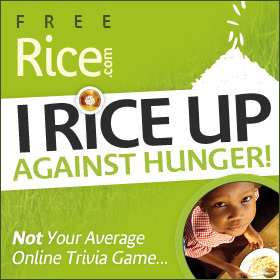 I was speaking to a fellow food blogger and she told me that about 100 people had been invited to the event. 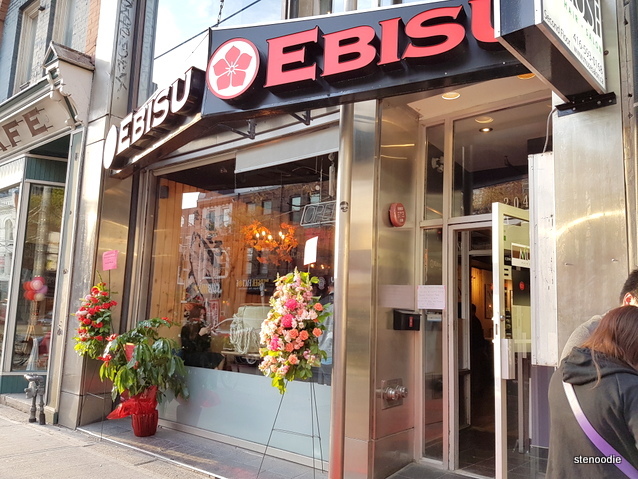 The location of Ebisu, in my opinion, certainly doesn’t allow for 40+ people to be squished into the space. 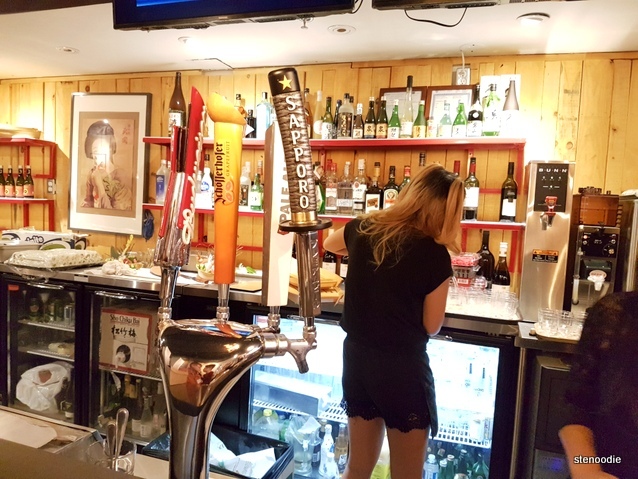 In any case, when I first arrived to the restaurant, I was welcomed with a drink. 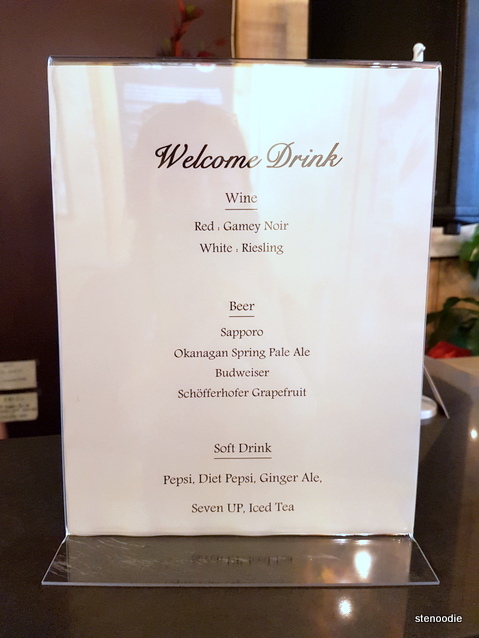 I chose a Sapporo since in the heat of the moment, I didn’t really take a good look at the drink menu and chose the first familiar item that I saw. There were a LOT of people inside and I could see that there was already a line-up for what looked like a buffet line for the appetizers. I headed to the back of the restaurant first while chatting up with a fellow foodie friend to get out of the crowd and took a few shots of the display items. Look at all of those dish set out on the bar! 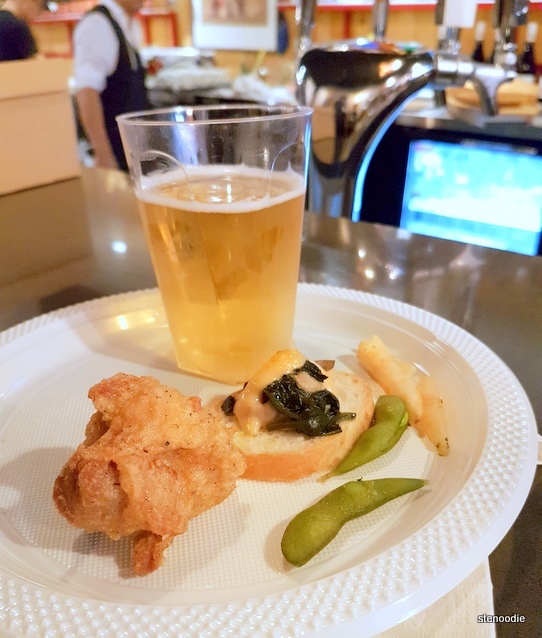 Next, I tried the appetizer items and I’m glad I did because shortly after this, they had run out (anyone else arriving later than that wouldn’t have gotten to try these). I enjoyed the oyster cracker. While the chicken karaage was very juicy and meaty, it also had huge chunks of fat deposits in it. The edamame and fries were average. 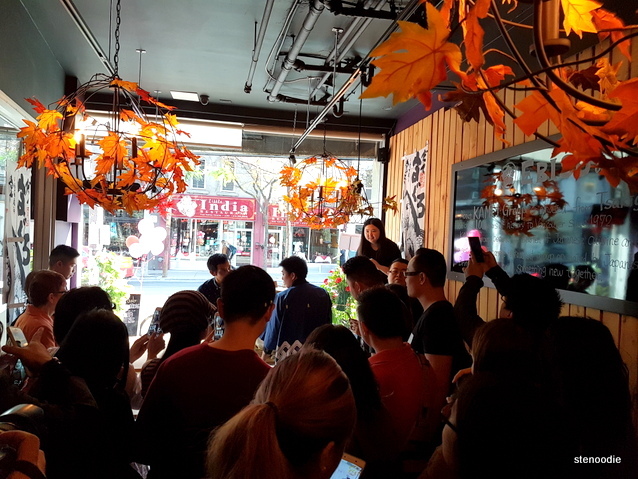 Around this time, there were a lot of people crowding around the front of the restaurant where the sake barrel ceremony was going to take place. As I had mentioned, Ebisu’s space is not conducive to over 20 people, nevermind 40 or more, in its quarters. Thus, those who were lucky enough to head to the entrance area of the restaurant were able to see what was happening above people’s heads. 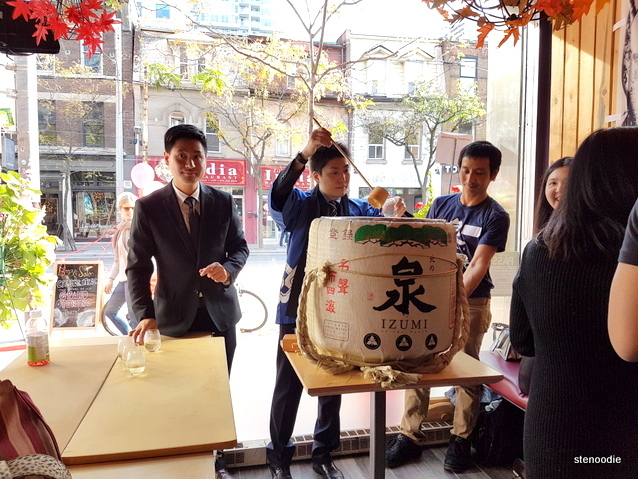 If not, it was unlikely that you would have been able to witness the sake barrel ceremony. 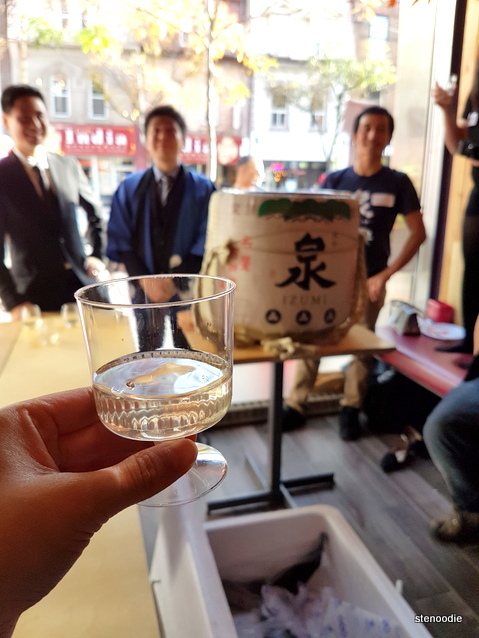 Being a short person, I did struggle to see what was happening at the sake barrel ceremony. I had to rely on the person’s camera viewfinder in front of me in order to see the actual barrel opening and also hold my camera high up in the air to capture these shots. There was a lot of excitement in the air and abundant number of cameras and phones pointed at the barrel. 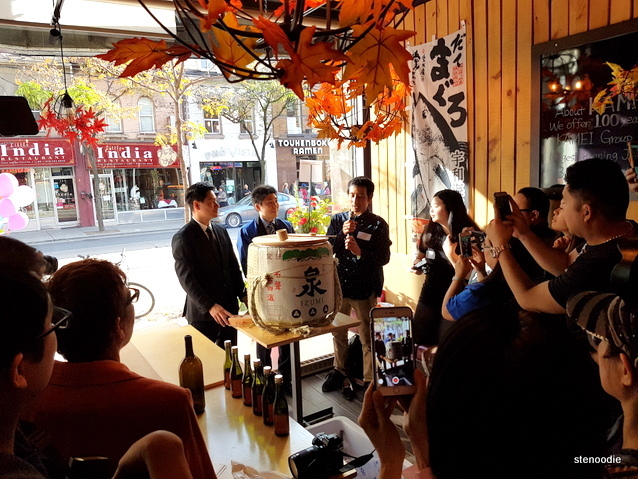 Once opened, the staff did a good job at distributing the sake from the barrel (or not) and we all cheersed to the grand opening of Ebisu on Queen. 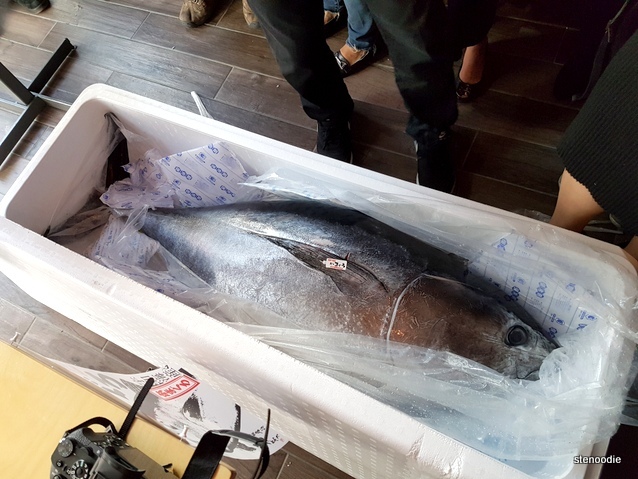 135-pound blue fin tuna from Japan! 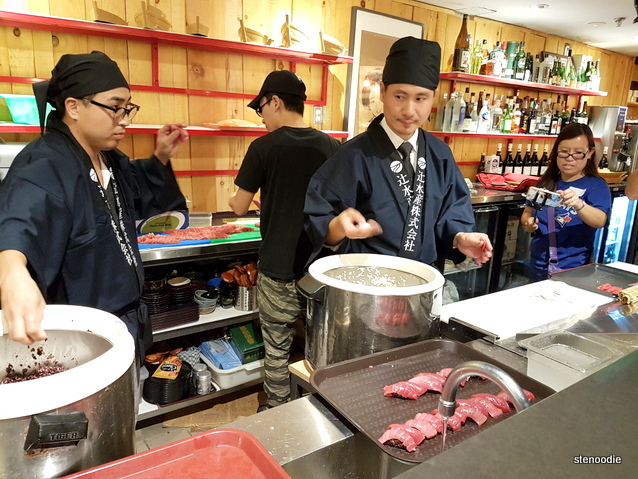 Next, in what felt like about 10 minutes time, the chef got ready to do the Maguro Kaitai Show for us. 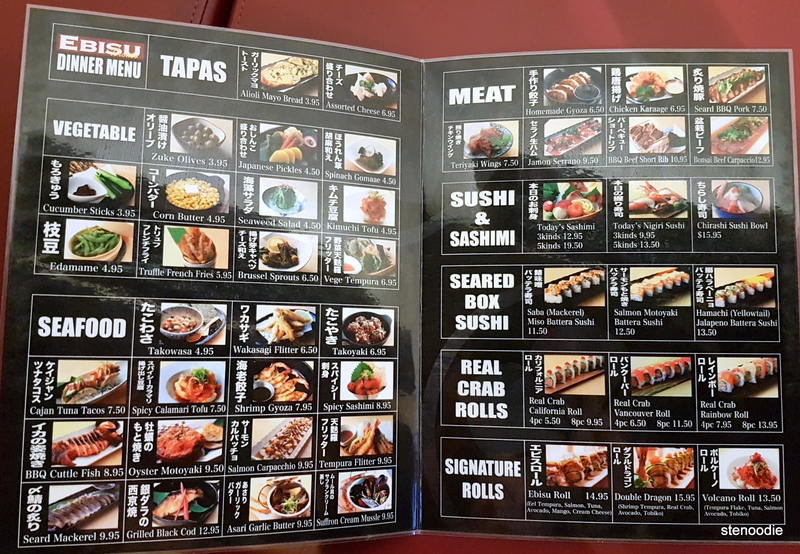 I could already see the 135-pound blue fin tuna flown in from Japan open in a Styrofoam box on the floor. It was gigantic! 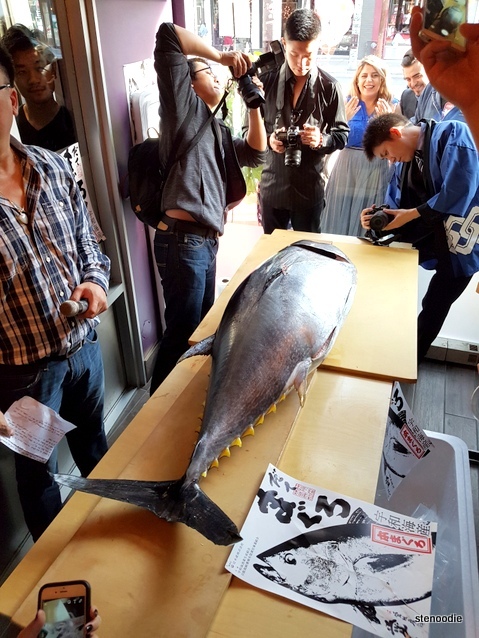 I don’t think I’ve seen such a huge blue fin tuna before. 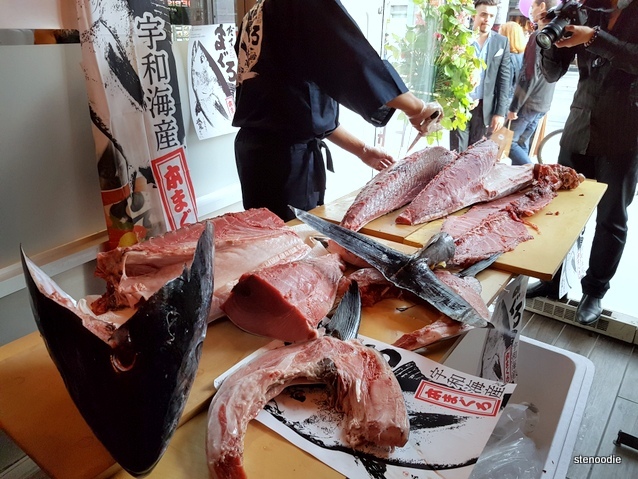 However, I have seen a Maguro Kaitai Show (blue fun tuna cutting show) before when I was in Okinawa for vacation a couple of years ago. The chef/expert/specialist — what do I call a blue fin tuna slicer? — did an exceptional job slicing and cutting apart the ginormous tuna. It was a sight to behold and all of us had our cameras up to record photos and videos again to capture the moment. This time, I was able to scoot myself to the front spot where I got an open view of the scene. I did feel sorry for those way behind me because there was no way that they could have seen anything other than the jostling of arms and camera screens. 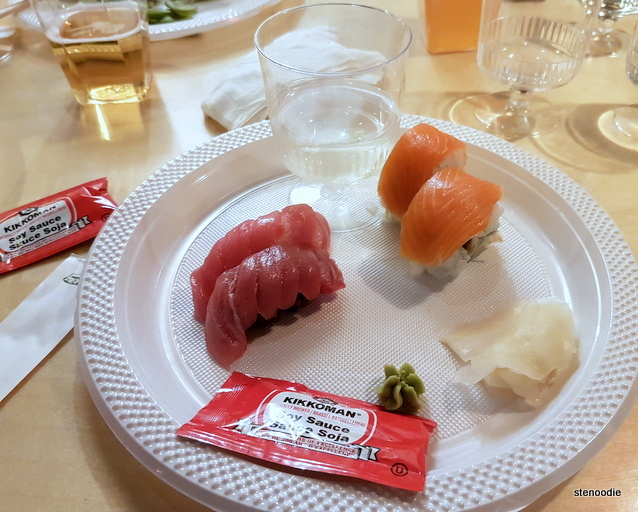 Soon, the Maguro Kaitai Show was complete and I mingled some more with the foodies who were there. Some seasoned foodies just gave up on even trying to watch the two demos since it would have been excruciatingly hard for them to get a spot in the crowd. This definitely speaks to the execution of the event, in my view. 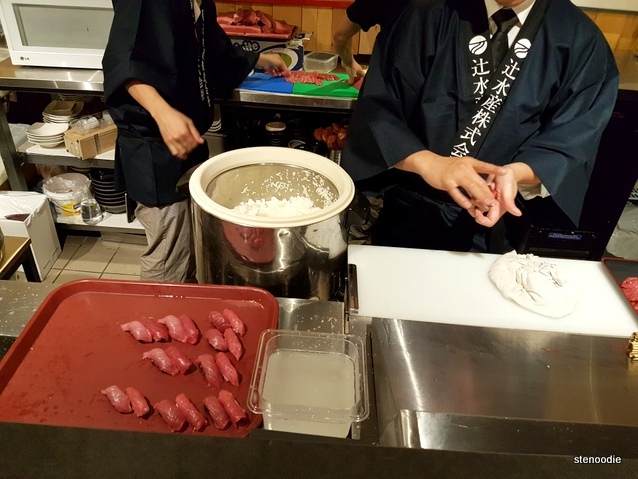 I spent the rest of the time before 5 p.m. to watch the sushi chefs assemble the fresh blue fin tuna into nigiri for us to eat. On the menu that afternoon were the bluefish tuna nigiri and Vancouver Roll made with real crab meat, avocado, and smoked salmon. The Vancouver Roll was prepared for us ahead of time and kept fresh in plastic cling wrap. I really enjoyed watching the chefs prepare the nigiri for us. 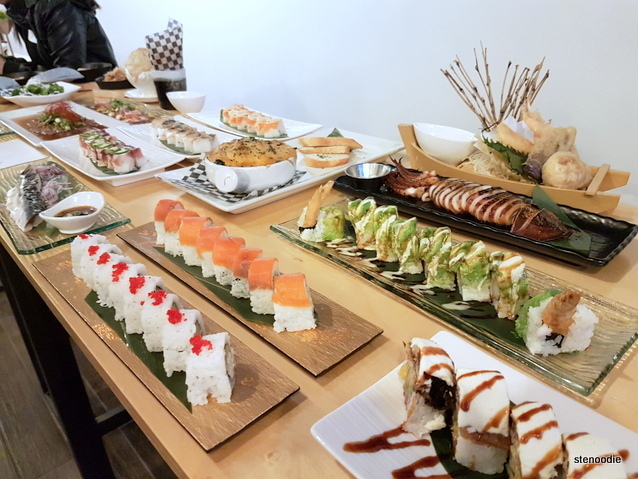 By exchanging the voucher that we received when we signed in (I wasn’t aware of this and had to ask one of the servers for it), we each received a platter of two pieces of Bluefish Tuna Nigiri, two pieces of the Vancouver Roll, and another serving of Kemeni Original Sake. I really enjoyed the Bluefish Tuna Nigiri and thought the tuna was exceptionally fresh and tender. The Vancouver Roll was just okay; perhaps it was the pieces I got but it fell apart when I tried to pick it up with my chopsticks. Also, it was made en masse so it is always difficult to judge the quality of such food items. I left shortly afterwards. 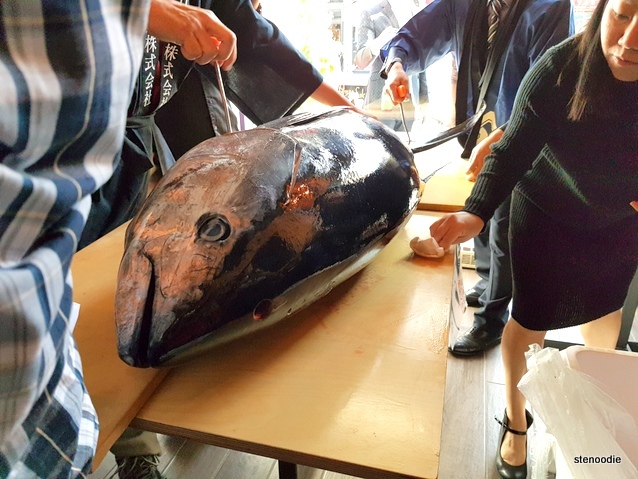 All in all, I’m very thankful that Loop Media Inc. invited me to the grand opening party of Ebisu to witness their blue fin tuna cutting as well as enjoy their sake and sushi. 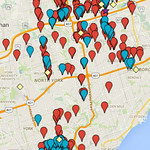 However, I do think it could have been organized a little better. 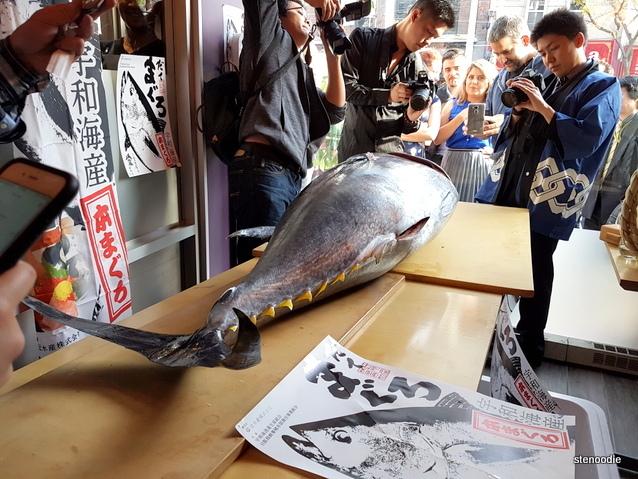 For one, there were too many people in one space that some people didn’t get to participate in watching the sake barrel ceremony or blue fin tuna cutting show — there simply wasn’t enough room for everyone in attendance to stand around. Second, because there were so many people there, it was incredibly warm inside the restaurant. Many of us were standing around with sweat rolling down our backs because it was so crowded inside. Third, if it was so warm inside the room, wouldn’t that not have been good for raw fish to be served? Hmm… food for thought! In general though, the entire atmosphere did fit the “party” aspect so what can I say. 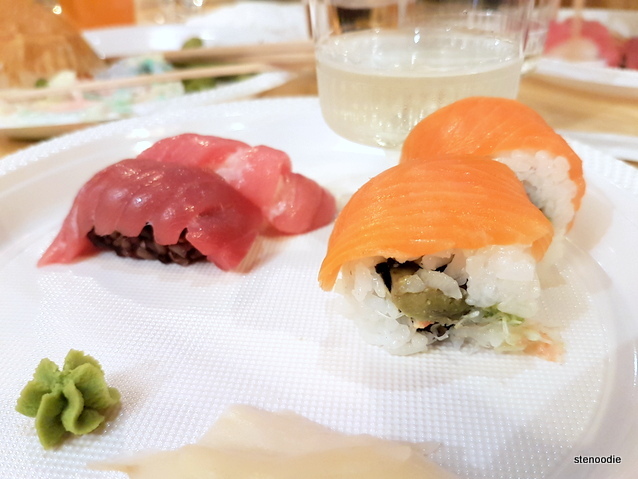 People got exposed to Ebisu, had the opportunity to try out their sushi and select appetizers and drinks, and connected with other foodies. Despite all, it was a productive gathering. 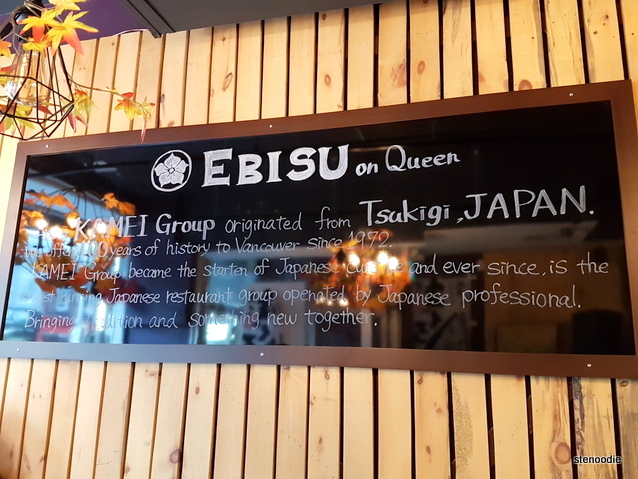 I received a $20 gift certificate to return to Ebisu to enjoy their food in-house so I am definitely looking forward to it. That way, I can try out their food for real! 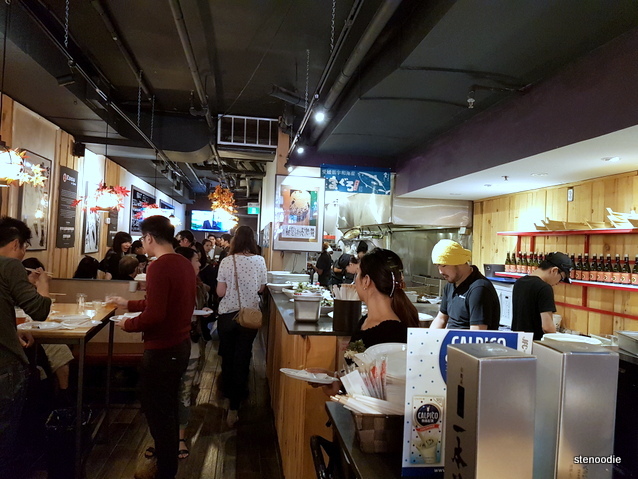 FTC Disclaimer: Although Loopp Media Inc. invited me to a complimentary tasting at Ebisu, the opinions expressed here represent my own and not those of the companies. This entry was posted in Complimentary Adventures, Food and tagged 204 Queen Street West, blue fin tuna cutting show, Bluefin Tuna Nigiri, Ebisu, Ebisu dinner menu, Ebisu on Queen, Ebisu Toronto, food blog, foodie, grand opening party, Kamei Group, Loopp Media Inc., Maguro Kaitai Show, new in Toronto, restaurant grand opening, sake barrel ceremony, sake barrel ceremony at Ebisu, sushi restaurants in Toronto, Toronto, Vancouver Roll. Bookmark the permalink.